Luck may have played a part in his career, though having worked with Beck, Nine Inch Nails, Air, Gnarls Barkley, The Mars Volta, Tori Amos, Dixie Chicks, Macy Gray - and that’s not even half of it - you can’t help thinking JMJ is probably one of the greatest session bass players in music history. “I divide my time playing and producing, constantly multi-tasking,” he continues. “I guess in more recent years, I’ve spent a bit more of my time in the studio as a producer. My session playing career has become more minimal - I do it on a case-by-case basis, while before I used to go and do whatever. “Now, I have to prioritise my time, which is a strange luxury to have, I’m not used to it… I’m used to hustling like anybody. “I’m a natural chameleon,” he laughs. “I wouldn’t say I’m a vain person or the kinda guy that sees myself as a renaissance man - someone who, out of ego, has to be involved in all sorts of styles, approaches and hats. “It’s more of an osmosis thing, where I feel this weird musical vibe in me… it’s a hard thing to explain. I just land in places! I don’t find a lot of comfort in sticking with something, which may work to my detriment. “Early on in my career, when I was only a musician, I was in this band called Medicine. We were a bit like LA’s answer to My Bloody Valentine - signed to Creation in the UK and Rick Rubin’s American label at home. Everything was noisy and caustic but there was also beautiful melodies and harmonised vocals. “It was cool… we toured, made no money but had a good time before the band imploded. During that time, I quit a job and somehow fell into this idea of playing in recording sessions. “In LA, you either get into the session scene by extraordinary skills and mind-blowing talent or simply by being there. I honestly don’t think I started out as the former; I was just around! “I don’t want to say it was just luck, but I found myself in a lot of different circumstances. I did some hip-hop stuff, then pop, then film and TV, met a guy called Tyler Bates, who is one of the biggest composers in the world right now, and ended up doing all his films. “By the time I was playing with Beck in ’95/’96, I learned his whole raison d'être was being musically liberated and having a lot of range,” he notes. 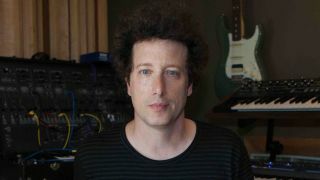 A different sort of big break came in 2008, when Justin was invited by Trent Reznor to be part of NIN’s touring line-up - headlining the biggest stages the world had to offer. “Robin’s one of the finest musicians on the planet and is literally capable of anything. We’re good friends and our families hang out… he just floors me with his incredible passion and delivery and all that beautiful sound design. In my eyes, he’s the best guitarist on the planet. “The biggest pitfall is when you cross a line and show frustration at what you’re being asked to do,” offers Justin. “That happens when you’ve done one too many sessions with that artist! You hesitate or roll your eyes or sigh… if there’s a moment like that, it’s a real dark hole of jadedness you can get into. “There have been moments I’ve felt like doing that, because you might not be playing the best music or whatever, but I chose to hold it together and was better for it. “The other pitfall I’ve seen is when people start getting carried away with gear and thinking that the latest, greatest modern thing would be perfect for whatever record they are working on. I’ve seen it happen time and time again. “There’s nothing wrong with progressing and trying new things, but when you’ve been called into a session or inhabiting a role - it’s good to put into context why they called you, why you’re there.